Fertility Resources of Houston has agreed to be responsible for providing services in accordance with the following American Society for Reproductive Medicine (ASRM) and Society for Assisted Reproductive Technology (SART) Statements, Technical Bulletins, Committee Opinions and Guidelines and Minimum Standards (“Practice Guidelines”). All Federal and state guidelines on gamete donation. 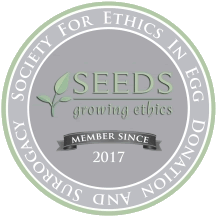 Fertility Resources will not compensate egg donors over $10,000.00.